Today was a day like many others, lived to the rhythm of the village. Jack and I hit the garden early – we were out with wellies on and tools in hand by 9am. A good time to be digging before the full heat of the day beats us back indoors to the cool of our stone-built house. The only down side to our (relatively) early rising is that none of the other children in the village are up and about yet, so there is no distraction on hand for Jack. While he loves to help (all the while telling me what a good helper he is) the joys of chasing round the garden with Alberto or Pelayo last somewhat longer than those of digging in the earth when Mummy’s attention is more firmly fixed on her ongoing war on weeds than it is on her darling boy. Soon Alberto’s grandfather, Aurelio, appears. He takes his usual seat beside the hedgerow just outside our garden. 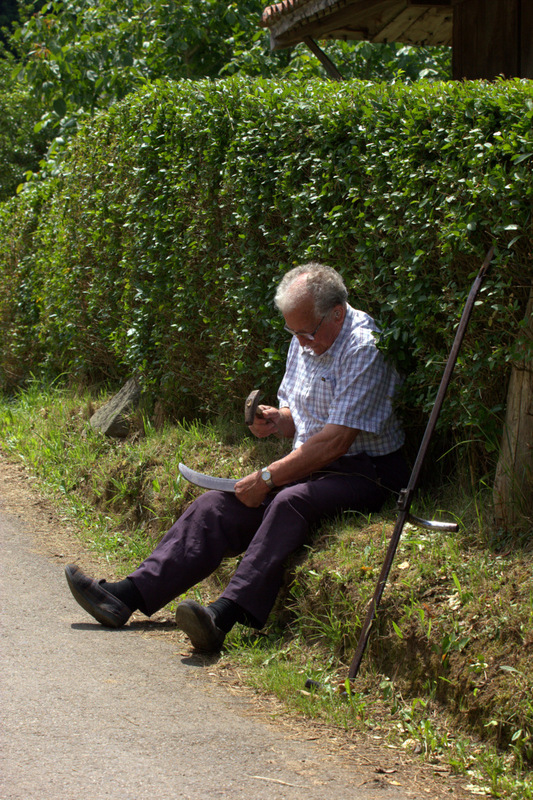 This is the spot where most mornings and afternoons he sits to patiently sharpen his scythe before putting it to work in the fields. The tap, tap, tapping of the anvil on the blade beating out a gentle soundtrack to our days. Aurelio takes us over to the barn to check in on the calf that was born last night. We were lucky enough to have seen it when it was only minutes old – pretty mindblowing stuff for a young child. Jack is delighted to see how sturdy and active it is already. As the barn is directly underneath Alberto’s house our visit to the calf has the added bonus of alerting him to Jack’s presence and he soon descends with his ‘moto’ to commence the serious business of playing. The pair ride their motos round and round the garden performing stunt crashes while I weed furiously, making the most of the childcare assistance. Beneath the squeals of children playing, the steady thrum of bees buzzing about their business often accompanies us around the village. Today it grows to a crescendo and the realisation dawns on me that one of the hives in the next field is swarming. I unfold myself from the flower bed and look on, agog; warily watching for where they might be headed. The only other time I witnessed this phenomenon was four years ago when a hive swarmed onto our house. As we watched, horrified, the white walls of the third floor of the house turned black with clustering bees. I remember Aurelio stood next to us at the time, chuckling so hard that tears came. When, moments later, a second swarm came and did the same thing to his house he didn’t laugh quite so much! Both swarms installed themselves in our respective attic spaces and despite callling the local bee expert he was unable to get them out and into a hive because of difficult access. They never gave us any trouble – the only way we knew they were still there was for the occasional, distant noise of formula 1 racing cars and the heavy, gorgeous scent of honey perfuming the air of our salon at certain times of the year. Then one year they picked up and moved on. Still, you can understand why I was keen to see them safely re-homed somewhere suitable. The afore-mentioned bee-man had told us cautionary tales of bees taking up residence in much more problematic places than our loft space and I didn’t want to find them swarming in my kitchen this time! 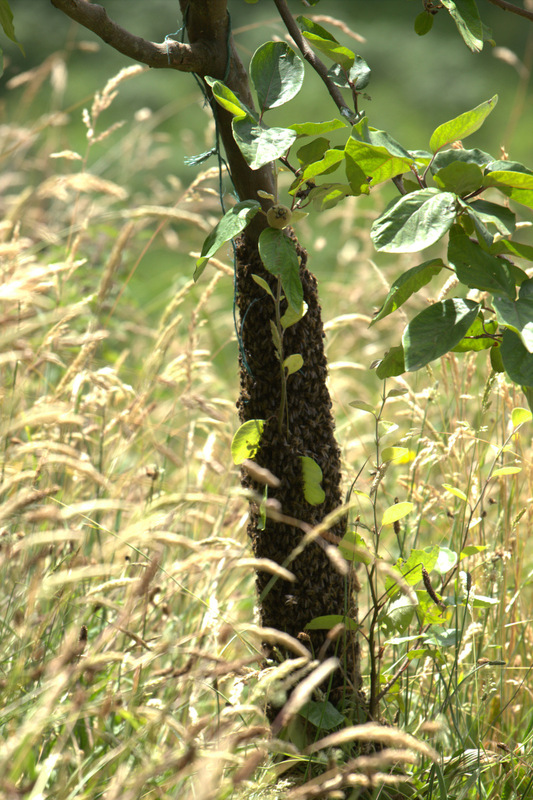 Today they clustered around the trunk of a young tree in the field waiting to decide on a new hive. When swarming like this the bees are dopey and docile and non-aggressive. Still, I took this photo of them using a big lens so I didn’t have to get too close. Alberto senior dashed off to get his bee-suit and a spare hive. Like some strange arch-bishop he swung his smoker, filled with wood-shavings, to entice them into the hive, placed at the bottom of the tree. Once the first few have entered, he leaves them to complete the house-move themselves in their own time. Reinforcements arrive. Alberto dons his beekeeper suit. The children are truly fascinated by both this spectacular display of nature in action and by Alberto’s cool armour-like suit. Once the excitement is over it’s time for their lunch and a much-needed siesta. The road and fields are empty for a couple of hours, then post-merienda time (afternoon tea, about 5pm) the village stirs again. The children take to the street with their bikes and trucks and toys and the adults return to their outdoor tasks with them. The cool of the early evening is filled with play and pottering in the garden. Watering with hose and can is a favourite all-family activity. After which, it’s time to water and feed the family again as the day draws to a close. I’m linking this post up to ‘Country Kids’ over at Coombe Mill. Click the badge below to read about some more outdoors family adventures. What a lovely view of your Asturian life, with Jack growing up so close to nature – especially loved seeing, and reading about, the new-born calf and bees. So great to read about customs in other parts of Spain, too. A really wonderful post. Thank you. Thanks for your lovely comment Fiona – it’s really very much appreciated. 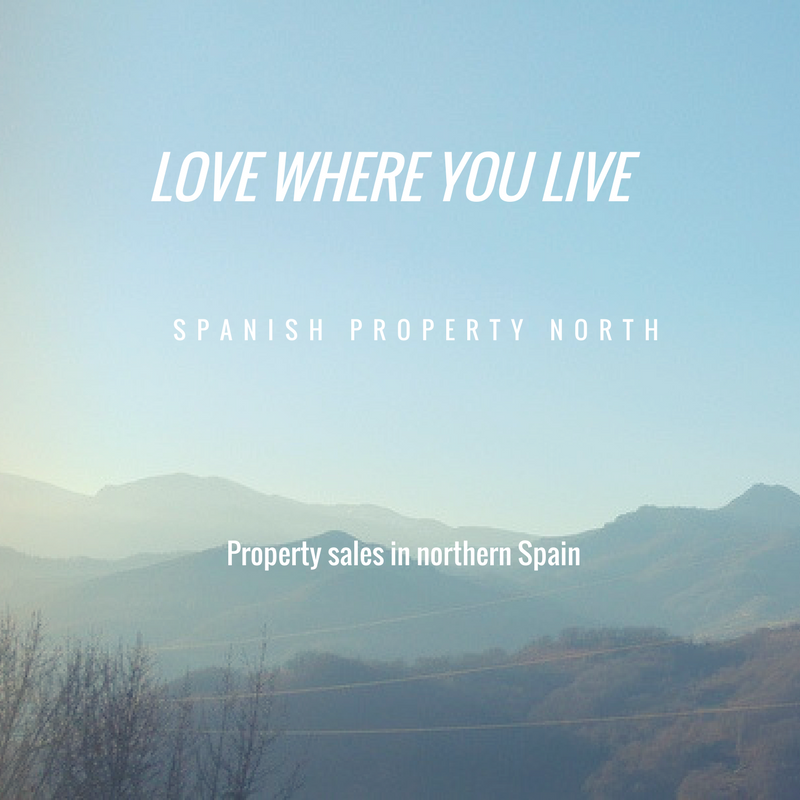 We do feel privileged to be living where we do. It may be the middle of nowhere but there’s never a dull moment and I think it’s so great for Jack. The things he’s seen already! Simply wonderful!! I envy you. Keep writing. Thank you. Oh, thank you so much for reading and for your lovely comment. Really enjoyed this “day in the life” post, and love that Jack is encountering such a world of natural wonders. Seeing a calf being born–what an amazing experience. I can still recall when my mom picked me up from school in second grade to see our cat give birth! Hi Erin – I’m so glad you enjoyed the post. It is such a great place to be a small child – like you say, a world of natural wonders. The stuff that childhood memories are made of, for sure. Of course, once Jack nears adolescence he might not be so keen on village life but we’ll cross that bridge when we come to it! It sounds idyllic! One of the biggest things I miss about our currently transient life is the ability to not only plant a garden, but watch it grow and mature over the years. Hopefully, this year both ourselves and some long anticipated fruit tress will be able to finally take root. At least for a little while. I do feel for you Rachel. Seeing the fruit trees we planted the year we arrived here finally bearing a good harvest (6 years later) is something I find really satisfying. Here’s hoping your fruit trees and you put down roots happily. Even if it is just for a little while. This entire day described so effectively here has me smelling honey and hearing bees and remember my own children as tots buzzing about on their riding toys while I worked in the yard! You have SUCH a great neighbor in Aurelio! 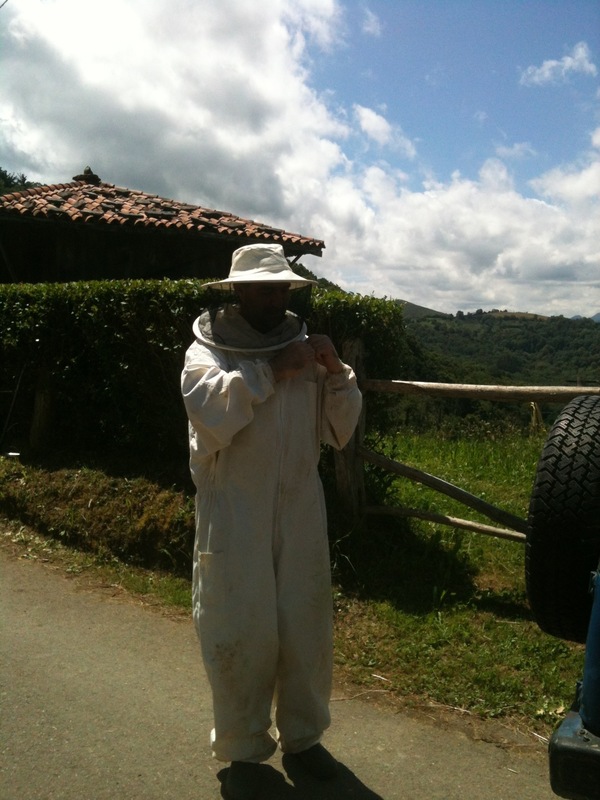 And Alberto’s beekeeper suit is most enviable! Having seen many newborn calves on our family’s cattlefarm as a child, I rejoice that your little son was privileged to view this newborn, ever-so-healthy calf and its devoted mother. I love the satiny, caramel-colored coat of this fine cow! The caramel-coloured Asturian cows are just gorgeous, aren’t they? I am so happy that Jack has the opportunity to witness events like this, thanks to our neighbours. I grew up on a farm so I have lots of similar memories – it’s nice to know he will too. Thanks for reading Fiona. You can’t beat the magic of witnessing new life, that’s for sure. We’re so lucky to get to share in the best bits of farming, without having the full time commitment! What beautiful photos to illustrate. The new born calf is a delight as I have never actually seen one.. Thanks for reading. 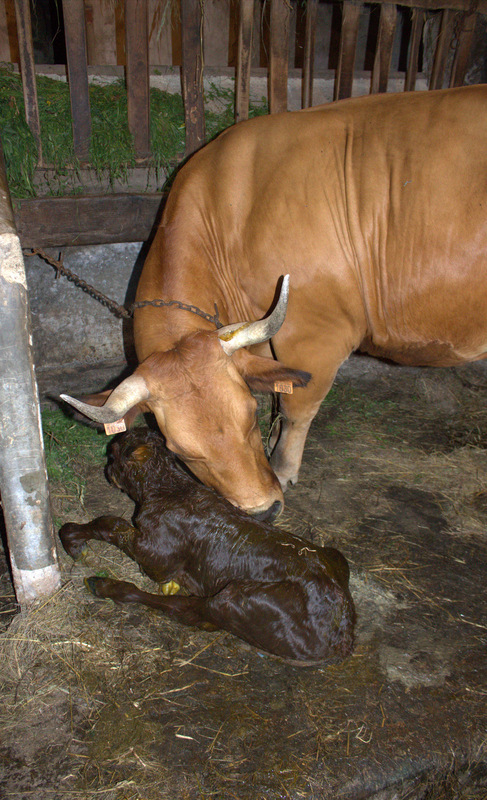 It was great to be there to take a photo of the calf when it was just born. So beautiful! I do love my life here, it has to be said! Thanks for stopping by. It sounds so much like the village where my family has an old family-home perched on top of the hill with fantastic characters for neighbours.